Cameras Downunder Gallery - Stereo/Fuji Rensha Cardia camera. Fuji Rensha Cardia 16 lens camera - the camera has 3 shooting modes - slow, fast and, very fast. 1st frame can start either from left or right hand side depending on the direction of travel of the subject. An unusual feature is a second shutter release on the left hand side of the camera allowing you to take single photographs. 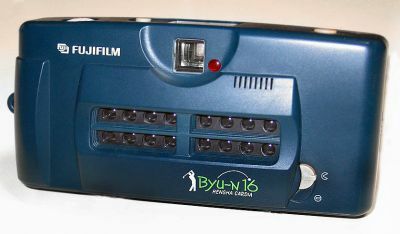 The camera takes 16 photos across 2 standard 35mm frames.